Well... this is hardly the resounding post I should be putting together to break the silence. I was away working for six weeks without internet and then I was back in Victoria for a whopping four days before heading up to Fort McMurray for a few weeks. I have been back in Victoria for just over a week now and I'm finally starting to feel like I'm settled back in. I have been sneaking in little birding excursions when I can and this morning was rather productive. With a Red-throated Pipit reported along Puckle Rd. near Martindale Flats last weekend, I thought I would see if I could sift through some pipits. I arrived at the fields at around 8 a.m. and there was a light veil of fog hanging over the fields. This was a little discouraging as it reduced the visibility, but I could hear pipits out there. I pulled to the side of the road, grabbed my scope, and did my best to find tail-bobbing birds popping up from furrows in the soil. While doing this, I noticed blackbirds and European Starlings flying in from the northwest and landing on the wires. I gave them a quick scan because a Rusty Blackbird was reported in local flock a few days earlier. My mind was set on pipits at this time, though, so I quickly went back to trying to pick out a Red-throated and among the Americans. After half an hour or so of looking and listening to the same group of American Pipits, I decided it was a bust. As I headed back to the car, I noticed Eurasian Collared-Doves were at the edge of one of the fields with the starlings and blackbirds. I moved the car closer to the action and shortly after parking a truck pulled up. Jody Wells, a birder I had bumped in to once before at Tod Creek Flats, provided good company as we scanned through the blackbird flock and small groups of sparrows dropping down to the ground along a fence line. While chatting with Jody, I said he should let me know if he ever finds any interesting birds during his walks. He said he wasn't as intense with the birding as others, but he has come across some interesting birds. 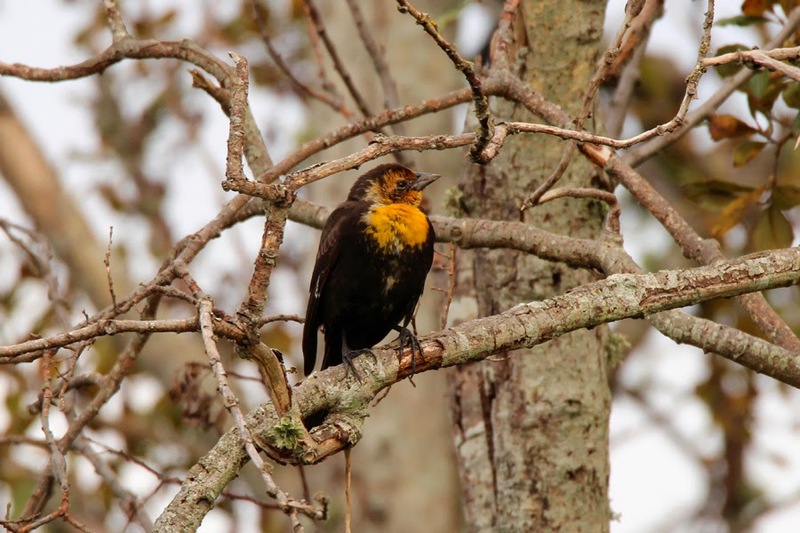 One sighting he recalled in particular was three Yellow-headed Blackbirds on Saanichton Spit. I was impressed - that's my spot and I certainly haven't found one there! At that point, I mentioned there was supposed to be a Rusty Blackbird around and it could well be in the flock we had in front of us. Well, wouldn't you know it... I couldn't dig out the Rusty Blackbird, but I did find a first-year male Yellow-headed Blackbird! I got Jody on the bird and we both marveled at the brilliant yellow patch on its chest when it turned the right way. The flock was rather restless and Jody noticed that they all put up after a Mourning Dove darted in towards them. They must have mistaken the swept back wings for a Merlin that we'd seen zip by earlier. Eventually the Yellow-headed Blackbird ended up on the road near the very end of Puckle Rd., surrounded by Red-winged Blackbirds, European Starlings, a few Brown-headed Cowbirds, and a smattering of Brewer's Blackbirds. I crept my way up to the flock and maintained a healthy distance to take some record shots. Easily the best look I've had of a Yellow-headed Blackbird in Victoria! Another familiar face, Barry McKee, rolled up as Jody was heading off. I managed to get Barry on the Yellow-headed Blackbird and he snapped one shot with his camera before it flew, likely rejoining the flock on the fields. This was only my second self-found Yellow-headed Blackbird for the Victoria checklist area and I would gladly take that over a Rusty! This sighting paired with seeing a couple of familiar faces made for a great morning. I just looked back through the BCVIBIRDS archive and learned that my first self-found Yellow-headed Blackbird was almost two years ago to the day. 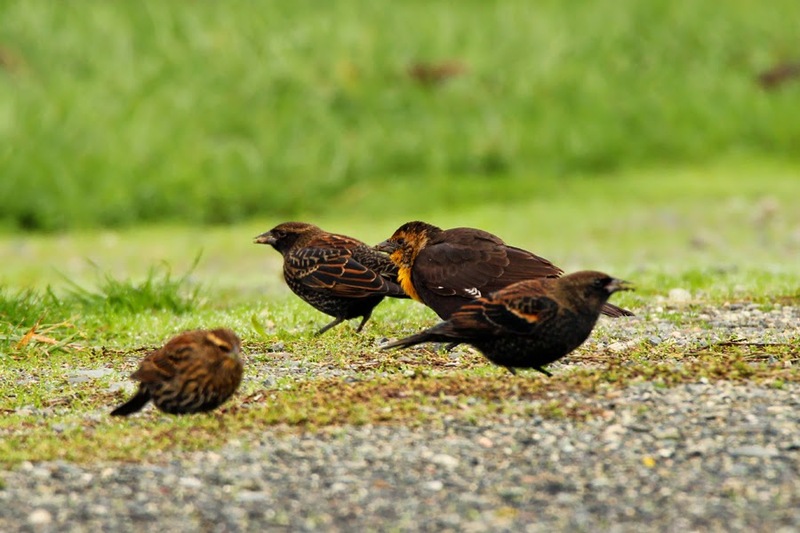 I went to the Vantreight bulb fields on October 19, 2012, the day after returning from a work trip, and found a female Yellow-headed Blackbird in a large blackbird flock off Wallace Dr. I guess mid-October is a great window for uncommon icterids! Is it too much to hope for a grackle?